Tranquility, relaxation and relief. These key words demonstrate the feeling that is created after using the iRobotics chair and other massage therapy products provided by Luraco Technologies, Inc. Believe it or not, Luraco’s international trade of luxury and military therapeutic mechanisms began with the international sales development of a simple yet specialized nail clip for extracting finger nail clippings and dust from the air in nail salons. 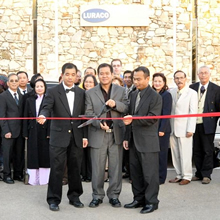 In June of 2007 in hopes of finding potential buyers and to launch international sales outside of the United States, Luraco, a U.S. based Vietnamese company in North Texas, contacted the International Trade Center SBDC (ISBDC) in Dallas, Texas. During an initial visit to Luraco, the ISBDC was educated on Luraco’s product line as well as had the opportunity to meet the founders of the company. After the visit, the next step was to establish the product line within the countries of Mexico and Canada. This involved working closely with the ISBDC when reviewing marketing brochures and advertising materials used with the two countries. On the logistical side of the business, the ISBDC assisted with deciding on the best type and location of distributors to enter the foreign market. In the end, the export was a success! Fast forward three years later to 2010 and Luraco was ready to export its spa jet units to Europe. However, a small yet complex question concerning product description and classification arose. Classification, which gets quite technical, is one of the determining factors of how much an international export will cost the person or business who is buying or selling the product. Because of its longstanding relationship with the ISBDC, Luraco gave the center a call for classification assistance not only for the spa jet units, but for the spa pumps and air filters for the units as well. The ISBDC and Luraco worked through the proper description and classification of the product which then allowed the client to obtain the specific amounts of duties and tax that would be applied to the products once exported. Once again, another success! Within the next two years, Luraco ventured into exporting spare parts for its massage equipment to Canada and Mexico which included indepth contact with the ISBDC for assistance with shipment scenarios and requirements and documentation for qualifying for the NAFTA. Currently, Luraco is expanding in other international markets and the ISBDC will continue to be apart of the international trade adventure. Congratulations Luraco! The ISBDC wishes you nothing but success in your future export markets.